A city in the grip of a housing crisis just spent $5 million on the Super Bowl. Yes, people are angry. On a daily basis, an estimated 2,000 pounds of “trash, human waste and hypodermic needles” are removed from the homeless encampments around San Francisco. These are the tent cities that form the backdrop to the monstrous spectacle of decadence that is Super Bowl week in the Bay Area. Last August, San Francisco’s Mayor Ed Lee made clear that a cleansing of the homeless would take place before the Super Bowl, saying, “They are going to have to leave. We’ll give you an alternative, we are always going to be supportive, but you are going to have to leave the streets.” Currently, there is no evidence of widespread mass-sweeps. But according to several Bay Area homeless rights activists and social workers with whom I spoke, it seems that when the cameras are on, the city cleans up trash. When the cameras are off, the city cleans up people, whom the San Francisco Police Department treat as if they are equally disposable. It is certainly true that one cannot blame the current mission-creep subtle-sweep of the homeless solely on the Super Bowl. That’s because for Mayor Ed Lee the crackdown on the homeless is not a Super Bowl phenomenon but a year-round game. In 2015, the police of San Francisco handed out roughly 2,300 citations a month to homeless people. That’s 77 every day. These citations lead to arrest, which leads to warehousing people behind bars instead of confronting the near total absence of affordable housing. The greatest sin in all of this is that 61 percent of the homeless lost their homes while still employed. There is just nowhere to live. 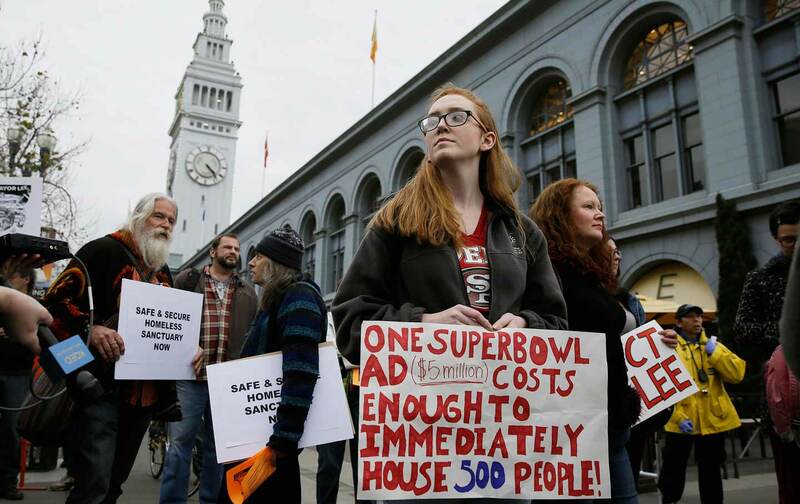 This housing and human crisis has led to a series of protests over the past week against the estimated $5 million in public spending on Super Bowl infrastructure, a deal that analysts are saying is lousy for the city. Five million dollars could have meant 500 units of new housing. Instead, it has gone primarily toward to building “Super Bowl City,” an NFL street fair for the locals who can’t afford tickets to the game. It’s a street fair branded with corporate logos and monitored, as journalist Davey D told us, by police in full body armor and rooftop snipers, turning public sidewalks into the property of the National Football League and their sponsors. Yet while Twitter HQ has become a symbol for the gentrification and skyrocketing costs in the city, the social media platform has also become an organizing tool for resistance. On Wednesday, hundreds took to the streets in a protest under the banner #tacklehomelessness. The protests are aimed at challenging the priorities of SF leaders. These protests provide the only vestiges of hope for this remarkable urban area that has become more than “a tale of two cities.” It’s a tale of two worlds. If there is one positive about the debt, displacement, and militarization that the Super Bowl has amplified in San Francisco, it is that it has shined a piercing light on the problems that plague the area. In the light of day, the priorities of this “managed simulacrum of a city” have never been more exposed.